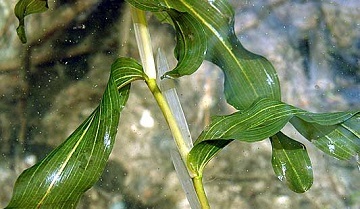 Whitestem Pondweed has a stem with a zig–pattern. Contrary to what the name would suggest, the Whitestem Pondweed does not have a white stem. Instead, the plant has a unique zig-zag stem. Its large boat-like leaves have 3-5 main veins and wrap around the partially stem. The leaves also have many white stipules, or outgrowths, on one side. Fruits and flowers are positioned at the end during mid-summer. Plants will die off during winter, leaving only rhizomes and new growth will sprout in the spring. Native to Main and New England, and is found in the northern and western parts of the United States. It is commonly found in lakes and streams. Spritflo herbicide or Dibrox herbicide will treat whitestem pondweed. Read all product labels for complete instructions before applying products.